What a surprise for everyone when, at the Prince's Trust's Tenth Birthday Gala Concert, held on 20 June at the Wembley Arena, Paul McCartney appeared to play three rousing numbers at the end of the evening. So we've naturally decided to base this issue around that great evening, which gathered the biggest group of superstars for a charity show since Live Aid last summer. Shown on BBC2 on 28 June, Americans should look out for its appearance on HBO. So the next issue will now be devoted to the new album, Press to Play, which will be released on 18 August. To give you a foretaste of it, the first single lifted will be "Press" itself, backed with "It's Not True" on the 7" single. The 12" version, a total of 23 minutes playing time, will have "Press", mixed by Bert Devan, along with "It's Not True", mixed by Julian Mendelsohn. The flip side has a new composition by Paul entitled "Hanglide", mixed by Mac'n'Matt, along with Bert Bevan's dub mix of "Press". A sure summer winner! I won't be giving away any secrets to tell you that this album is definitely one of the strongest selections of McCartney compositions ever, certainly worth waiting for! Also in August, watch out for the release by Picture Music (EMI) of an extended version of the acclaimed MPL/BBC co-production, "The Real Buddy Holly Story", screened last September by BBC2's Arena programme. Lasting 90 minutes - with half an hour of completely new material - this version includes a narration and further footage by Paul McCartney. For the astonishingly low price of £16.99, the video breaks new ground in marketing, as it is the first time that a video cassette has been sold along with audio cassettes. The special box/package comprises the video itself, along with two audio cassettes of 28 of the best-loved songs by Buddy Holly, and a metal American-style car number plate saying Buddy Holly with the first 15,000 copies sold. It's a great addition to any rock memorabilia collection. Lastly, Paul's asked me to thank you for all the fabulous cards and gifts you've sent in for his birthday. "I had a lovely one, thanks", he says. So next time, the filling of the Sandwich will be all the info on the making of the album. Visitors to MPL's offices will usually see a blur of activity at the far end of the reception area. The blur is Tracy Rayment and after nearly two years with the team we thought it was time you knew a bit more about her. After secretarial school in Beckenham, Tracy joined Heath Levy Music at 17 as secretary to the financial director: "I found myself head of the copyright department at 18 and stayed until I was 20. Then I left to spend six months in Monte Carlo. I'm mad on sailing and got a job as hostess on the Welsh Falcon, a massive cruiser, which meant making the bunks, cleaning up and so on. The Welsh Falcon went on to the Caribbean, but unfortunately by then I'd gone home for my twenty-first party. Another job while I was out there was as a deckhand on a 60-foot motor cruiser, living on board. We sow the Grand Prix from the boat, which was in just the right position." Returning to England in July 1984, Tracy began temping, but wanted to get back into the music business. 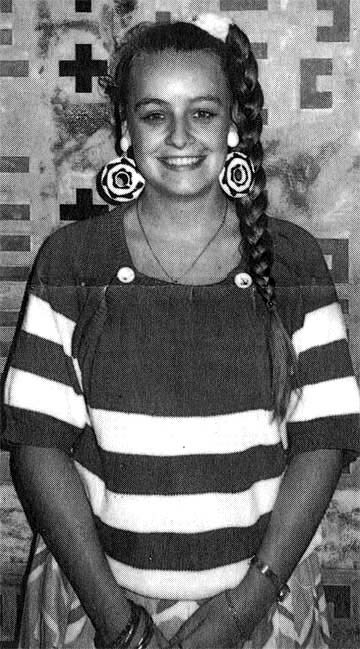 An agency found her an interview with MPL in September and she started the following week as a secretary, working for Shelagh Jones and doing "bits and bobs" for Alan Crowder. Since April this year, when Alan was made head of music publishing, Tracy has been his assistant. "I'm busier now than I've been since Broad Street, which was going on when I joined. It's mainly copyright work, as in my previous job: all the songs on Paul's new album need to be registered and there's the Buddy Holly 50th birthday video to be done too, getting approval for people's photos of Buddy to be used in it and lots of other things." Other tasks include dealing with TV companies who want to feature Paul's music and with magazines who want to quote lyrics. Our interview was delayed while Tracy dealt with a test pressing of Linda's "Seaside Woman" remix, another of her occasional responsibilities. With a name like Rayment you have to be well turned out and Tracy does indeed live up to her name. That blur at the back of reception is usually a colourful one and there's often something interesting in her tumbling tresses - nothing that moves, we assure you. Tracy lives with her parents in Kent, but they're moving to Brighton next year and she can't wait: "They have a motor cruiser down there and I love to be near the sea and boats. I'll commute from there - the train only takes quarter of an hour longer than it does from Kent." Though she left for a sailing holiday in the south of France soon after we spoke to her, Tracy also has musical interests of her own: "My parents bought me an organ when I was sixteen. I only know a few tunes and I can't read music, but I enjoy playing it." Wholehearted where her hobbies are concerned, Tracy brings a similar enthusiasm to her work. MPL are glad to have her. In July, August and September 1966 Paul was being a busy little Beatle, as you can see from the following items. Last of five Beatles concerts at Budokan, Tokyo. They were the first group to play there, a controversial innovation since the venue had been used for martial arts displays only until then - now it is the Japanese rock venue. Two Beatles concerts at Rizal Memorial Field, Manila, Philippines. Beatles arrive in New Delhi for three days' rest, but encounter screaming fans even there. Paul commissions left-handed sitar. Cavern Club re-opens with Premier Harold Wilson in attendance. Beatles send telegram. produced by Paul, also out. Paul appears on David Frost at the Phonograph (BBC radio). "Eleanor Rigby"/"Yellow Submarine" released. Revolver issued in US - minus three tracks already issued there in June on Yesterday And Today. Last Beatles concert, Candlestick Park, San Francisco. Paul starts work on film score for The Family Way. Interview with Paul appears in The Sunday Times. 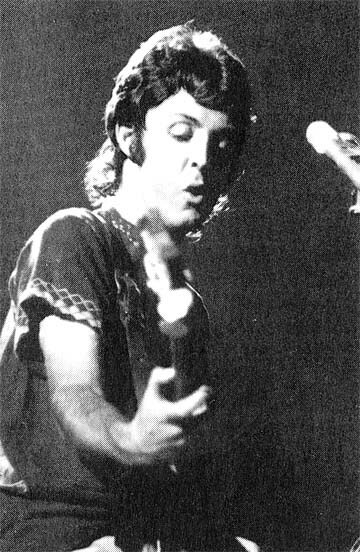 On the face of it, Paul was less busy in 1976 than a decade earlier - that wouldn't be difficult - but remember that the Wings Over America tour had just finished. Getting the tapes from this tour into shape for the subsequent live triple album took up much of Paul's time. There were also rehearsals for the European concerts in September to be fitted in. "Let 'Em In"/"Beware My Love" released. It makes No. 1 in the US and No. 2 in the UK. A 12" version in a "leopard skin" cover is released in France, including a disco version of "Beware". 15th September: Ringo's Rotogravure album released. Paul wrote and sings on "Pure Gold". 19th/27th September: Four Wings concerts in Vienna, Zagreb (Yugoslavia), Venice and Munich. Having expected a reserved response in Zagreb, Paul describes the crowd as "loony". 30,000 to 40,000 see the show for UNESCO (not UNICEF as stated last issue: sorry) in St. Mark's Square, Venice.